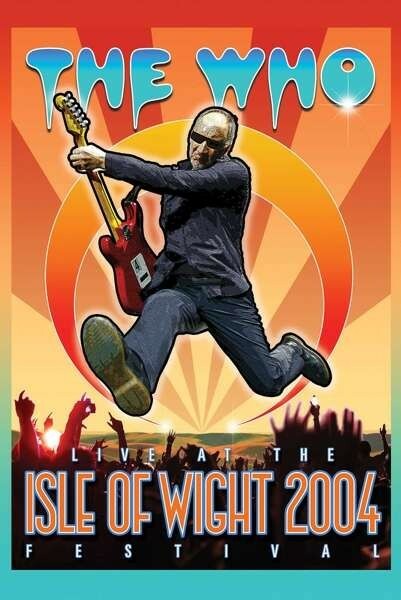 The last time The Who played the Isle Of Wight Festival was in 1970, back then they were a four-piece including drummer Keith Moon and bass player John Entwistle. Now, alongside singer Roger Daltrey and guitarist Pete Townshend, you have famed session bass player Pino Palladino, Pete's brother Simon Townshend on guitar, Ringo Starr's son Zac Starkey on drums and long-term keyboardist John "Rabbit" Bundrick. Also released individually on both Blu-ray and DVD format, this DVD/2CD edition comes in a gatefold cover with a small booklet detailing the show. The audio discs feature the same tracks as the DVD, but sadly there are no extras (such as interviews) on either edition of the DVD to enhance it. I will concentrate on the DVD as this will be of the most interest to fans of the band. The capacity audience comes alive as a sea of bouncing bodies emerge during the opening number 'I Can't Explain'. For the most part, the camera focuses on Daltrey and Pete Townsend. Starkey has his moments as he tries to emulate Moon's sonic onslaught to varying degrees of success. The stage is small with no backdrop, just the band intimately doing their thing. There are energetic run throughs of classics such as 'Who Are You' and 'Behind Blue Eyes', while Pete Townshend lets rip a few trademark windmill guitar moments, reminding us of his once aggressive stage presence (though the days of smashing up instruments are long behind him). However, he still spits out his vocal parts when needed, even taking the lead on 'Eminence Front', one of only two songs from their lacklustre eighties period. Daltrey, in his sixties at this point, still delivers the goods, swinging microphones and bellowing out vocals through 'Baba O'Riley' and '5:15'. Both Daltrey and Pete Townshend exchange cocky, knowing glances at their moments of brilliance, especially during the majestic 'Love Reign O'er Me' – one of the highlights of the show. The quieter moments, notably during 'Drowned', has Pete Townshend alone with his acoustic guitar not relying on the band's live thunder to propel him along. Deep cuts such as 'Naked Eye' and 'Old Red Wine' have the audience in a more sombre mood, before 'Won't Get Fooled Again' and 'Pinball Wizard' bring everyone to their feet. The Who continue to find new relevance with younger fans through every show they perform, with the Isle Of Wight being no exception.